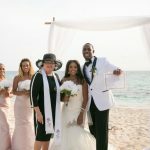 Today I broke my own rule of no more than one cruise wedding ceremony each day, because I really wanted to do this 25th Wedding Vow Renewal for a Texas couple. 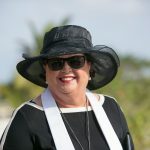 The husband told me that this wife had really been looking forward to their anniversary cruise and wedding vow renewal ceremony. 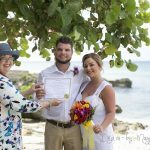 Despite the rainy, windy weather today we found a sunny spot on Seven Mile beach and the weather held up long enough for us to do the ceremony. Beach foliage provided a lovely backdrop for this celebrating couple. Can you see the wedding rings on the silver starfish? Posing with their wedding vow renewal certificate. 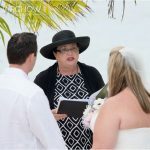 Whatever anniversary you're celebrating, call Joy or Peggy to plan your wedding vow renewal ceremony, and make this a very memorable year for both of you +1 (345) 9499933 or email mywedding@candw.ky to expolore the wedding vow renewal packages.